The cardiac chair position can be adjusted by pressing a single button to maximise respiratory function and cardiac output. This position improves the comfort for the patient and hastens recovery. 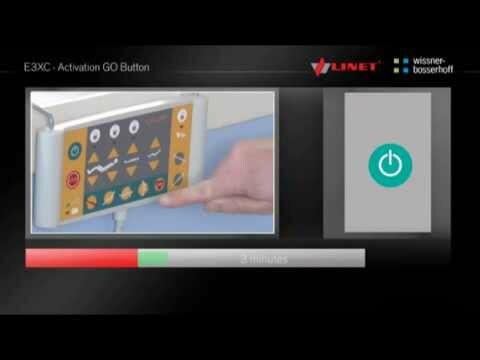 Variable side rails using the eleganza protector, multi zone bed exit alarm and i-brake feature provide a comprehensive falls prevention concept that can be used in accordance with the individual patient risk assessment. The automatic integrated scales indicate the actual weight of the patient, changes in time and includes a system for the addition or removal of accessories. The innovative Mobi-Lift handles, with height adjustment buttons, assist with the mobilisation process safely and effectively. The X-ray translucent mattress platform enables integrated X-ray examination or C-arm scanning. The design and functionality of the Eleganza 3XC healthcare bed is customised to meet the high demands of intensive care. This modern critical care bed with column construction offers many advanced features that help the medical staff treat and care for critically ill patients. The safe gaps concept reduces the risk of patient entrapment and associated injuries. The Ergoframe® positioning system extends the space in the pelvic area. Tissue compression and the development of pressure ulcers in this area is significantly reduced. The cardiac chair position can be easily adjusted by using a single button on the supervisor control panel. In the sitting position, the vital lung capacity increases and gaseous change improves. The variable side rails provide complete fall protection for patients. The Eleganza protector at the foot end helps to prevent falls of confused patients according to individual risk assesssment. The automatic integrated scales indicate the patient's weight and include a system for addition or removal of accessories. Unbraked hospital beds might cause falls. The unique i-Brake feature automatically activates the brakes when the bed is plugged into electricity. The unique Mobi-Lift handles with bed height controls assist with safer mobilisation and active involvement of the patient. The practical foot controls allow an easy hands-free bed height adjustment. As a result, the medical staff is able to create optimal access to the patient for hygiene needs, wound care and examinations. The retractable 5th castor i-Drive helps to manoeuvre the bed during transportation and can be retracted into the chassis when not in use. The bed's unique construction base provides great stability and guarantees continued functionality when loaded to 250 kg (safe working load).